Weight Gain: I think were up to 13 at the doctor’s office. Maternity Clothes: Yup, ready to get some fall clothes now. Come on cooler weather. I need leggings and boots in my life! Stretch Marks: still checking, still making it! Holding my breath too, because my belly is growwwinggg! Sleep: I’m still getting up to pee a million times, but sleeping a tad better in between. Best Moment This Week: Watching her kick me pretty regularly. Miss Anything: an ice cold corona.. yum! Movement: Starting to notice a pattern. She’s less active during the day and more active in the afternoon/evening. I read somewhere it’s because me being up moving during the day rocks her to sleep. She’s definitely getting stronger; still feeling little flutters sometimes, but mostly real kicks and punches. Sometimes they’re in some odd places! I can see her kick sometimes too and Nolan has felt her a few more times. Funny moment – I sat in the rocking recliner at my in-laws and started rocking, and she started kicking like crazy! I hope she likes to rock when she gets here too! Noteworthy Moments: Nothing too crazy. I’ve been buying Whitlee some more clothes – I scored 19 outfits the other day for $36! I also went on a hospital tour where we’ll be delivering and got an idea of their process. One of the things I really like is that they don’t have a nursery, so she’ll be with us 100% of the time, unless there are complications, then she’ll go to the NICU if needed. They’re also big time skin to skin promoters and breastfeeding advocates, which are two things I really wanted to happen with our birth plan. So the visit really put my mind at ease! Plus the hospital is so nice and clean. The labor rooms and the mom/baby rooms for afterwards are so big! They also said I can bring a birthing ball if I want (if I’m doing a natural vaginal birth) and can use the tub for laboring. I also haven’t been having any track-able contractions, which is a plus. I’ve had a few here and there, but nothing continuous. I go back the doctor next week so I’m hoping she likes that I haven’t gotten any worse. Then in two more weeks, we’ll have another ultrasound to check on Whitlee and my placenta. Fingers crossed it moves up! 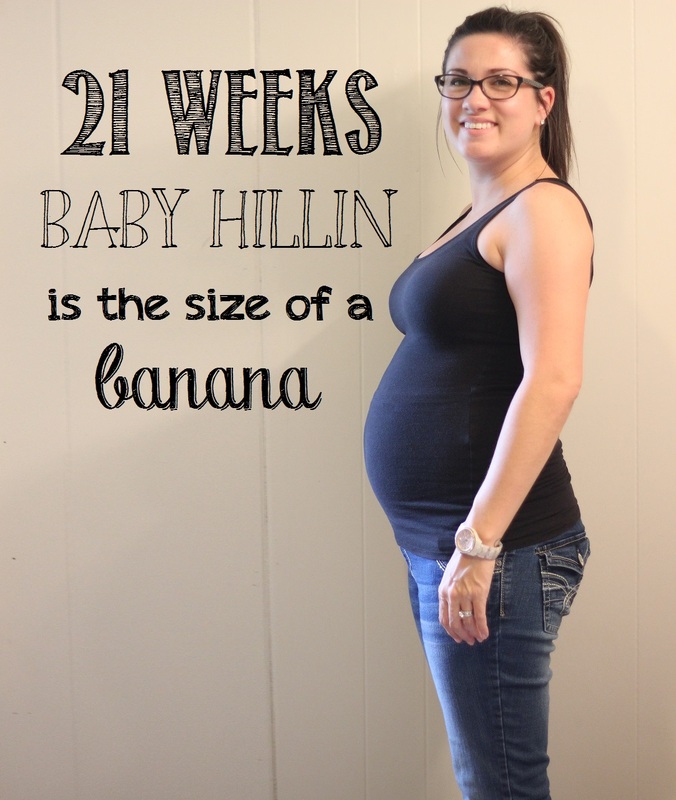 How Far Along: 20 Weeks – Halfway there!! Woo hoo! Belly Button In or Out: Still hanging in there! Sleep: ugh… so bad.. I have never been one for insomnia but sometimes I’m just awake in the middle of the night. I blame being uncomfortable. Best Moment This Week: Seeing her at our REAL anatomy scan! Miss Anything: being comfortable. I’m not in any pain really, just uncomfortable all the time. I know it will only get worse. Movement: Gah – this has been a HUGE week for movement. So Nolan was finally able to feel her move! I was laying on the couch and I felt her moving quite a bit on my right, so I started feeling her with my hand. After she was pretty consistent for a little bit, I called him and had him come in from working on the shop to feel her and he did! He said, “Was that her?? The little pops?” 🙂 So glad he finally got to feel her. Then I started SEEING her move! That is so crazy to me! The first time was when I went to the bathroom, and as I was leaning over to help empty my bladder I could feel her kicking like normal, but when I stood up my belly was like morphed out to the right and then it moved out to the left, like she was stretching out after me cramping her up when I leaned over. Since then I’ve been seeing her move all the time. I’ve also been feeling some harder kicks, and not just tiny flutters and pops anymore. Yay for growing! Cravings: I don’t think I’ve actually had any cravings this week. Symptoms: round ligament pain is getting even more prominent and I’ve been feeling a tad bit nauseous the last couple of days. Other than that, feeling pretty good! Noteworthy Moments: I wanted to wait until today so that I could post an update after our doctors appointment. They went ahead and did my real anatomy scan and we really got to see her in depth and see all of her body parts. I got some really cute pictures too! She’s still a girl – third time we’ve checked – and even though it seems like she’s grown SO much in the pictures, she’s still just a little baby. She’s measuring about half an lb in weight but right on track in other measurements, plus she still has some crazy long legs! Her heartbeat was 160 and she was kicking like crazy. We got to go over our genetic testing which came back all clear – no spina bifida, no down’s syndrome, and no trisomy issues. So genetically and anatomically, she’s super healthy! 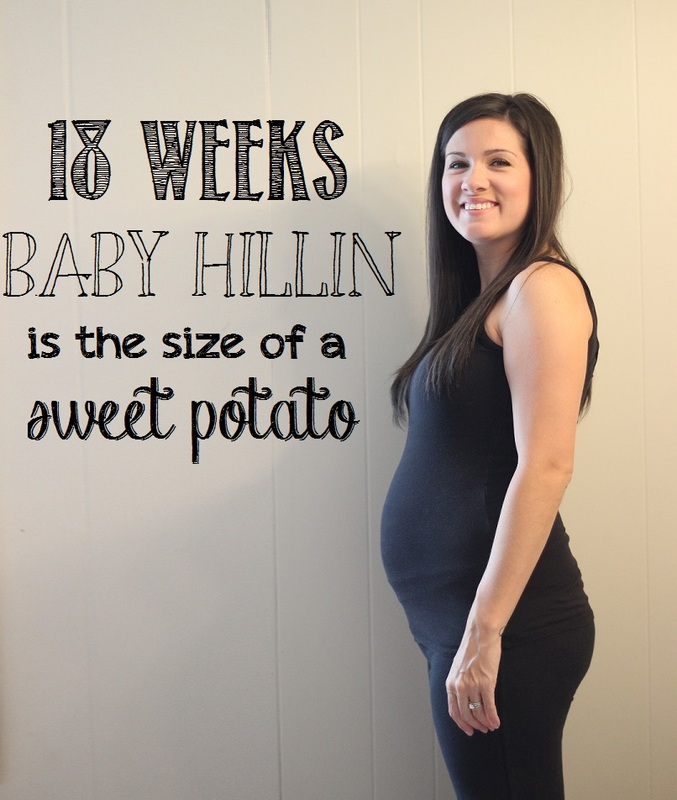 We talked a bit more about my contractions – which have actually eased up quite a bit. I haven’t had any since Saturday, so my doctor pretty much said keep doing whatever I’m doing. Then she hit me with the latest hiccup – I have a low lying placenta, also known as placenta previa. For those of you that don’t know what that is, it’s when the placenta grows over the cervix, blocking the baby’s exit. So at this point, we’ll continue to monitor it by ultrasound every 4 weeks and hope that as she grows and the uterus moves up even more, it pulls the placenta up with it. If for some reason it stays down low, we’ll be scheduling a C-section probably around the end of December. At that point a vaginal birth would be too risky for hemorrhaging, as well as the simple concept of she wouldn’t have a way out. I’m not too upset about this, except that I know I need to watch closely for any sign of bleeding and get to a hospital asap if I see anything, but I know they’ll be monitoring me and in most cases the placenta moves up anyway. My mother in law had the same thing when she was pregnant with Nolan and her’s moved up. If it doesn’t then I know my doctor will take good care of me and we won’t be causing any risk to me or Whitlee. Still considered “high risk” at this point, but things are looking up! I know it may seem like this has been a rough pregnancy to some people, but I don’t see it that way. I feel like whatever is thrown out me, I can deal with it as long as in the end we get our baby here safely! 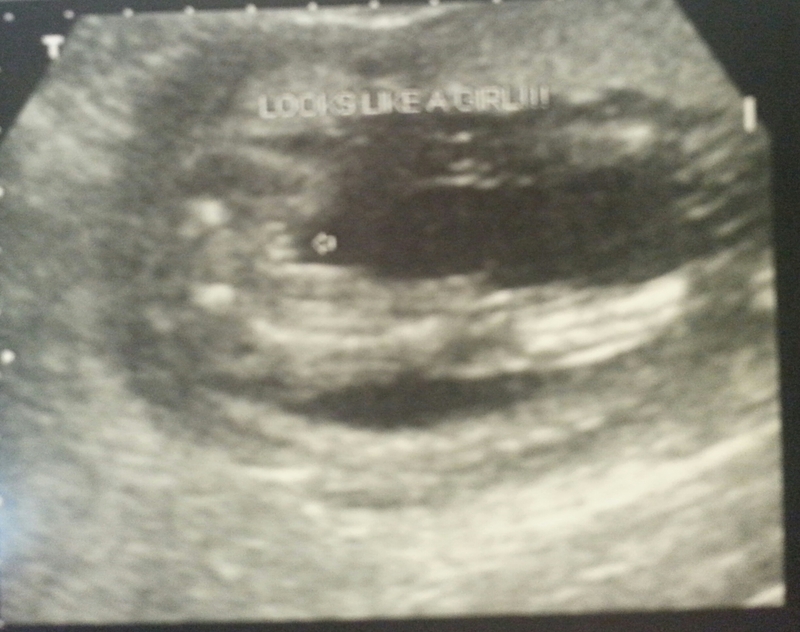 Now – on to some ultrasound pictures! Thank you to everyone that has called, text and commented for the well wishes from my last post. So far, so good with me and Whitlee. My contractions have gotten less frequent and less pattern-y so that’s a good thing! This past week has been an exciting week of surprises! I forgot to mention in my last post that Nolan’s grandparents brought us Whitlee’s crib. 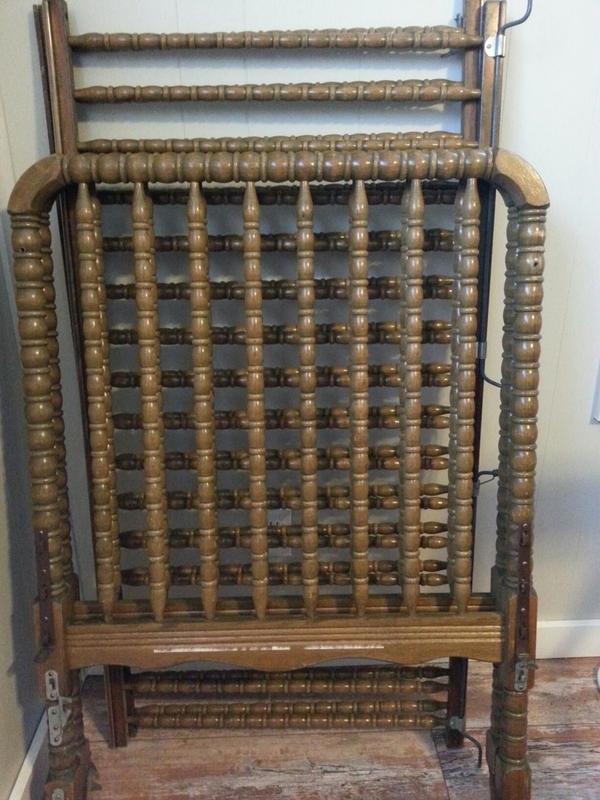 I have been searching for a vintage Jenny Lind crib that we could paint white, but just in case I’d registered for the new version of it at Target. Well they called last week with the news that they’d found a vintage one! They dropped it off at our house this past weekend. Its exactly what I wanted and Nolan will be taking it to work next week to paint it white. I cant wait to see it put together and in her room! Then I got a package in the mail, addressed to Miss Whitlee Alyzabeth! I thought that was so neat. 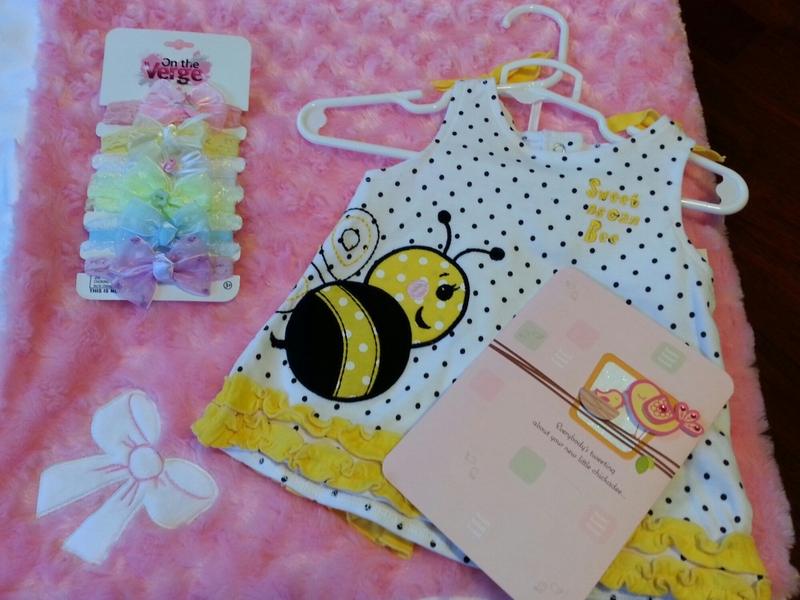 My nanny (grandmother) who reads all my posts and comments frequently, sent our little girl a super cute outfit for next summer, an extremely soft blanket, and some headbands with bows. I can’t wait to put a headband and bow on her all the time! Thank you again, Nanny! I love seeing her closet being filled with clothes and accessories. The last surprise was definitely a surprise, as we have absolutely no idea where it came from. 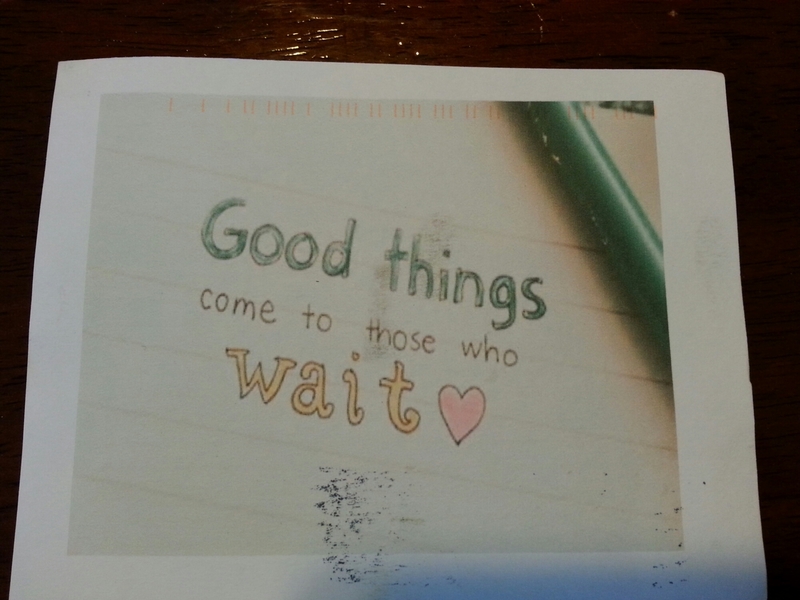 I checked the mail just a short while ago and there was a single postcard type peice of mail in there. 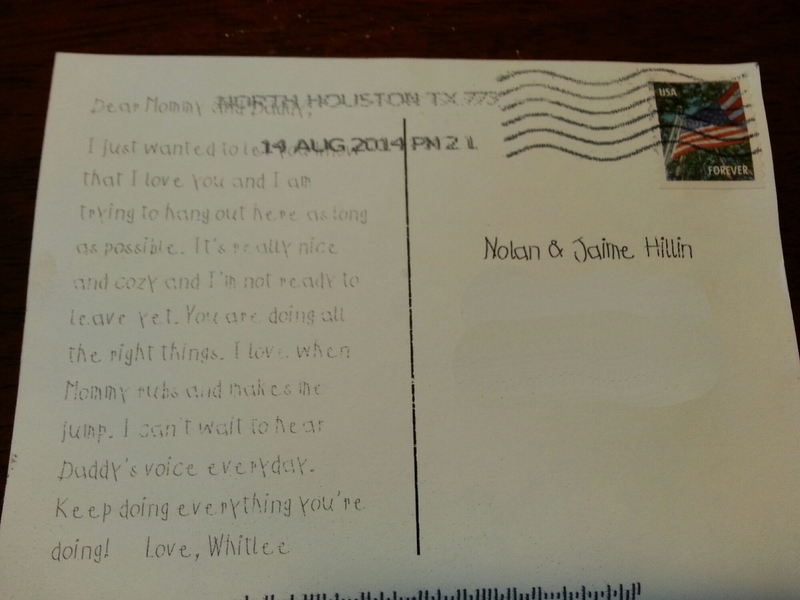 It was addressed to Nolan and I and it was a note from Whitlee. I just wanted to let you know that I love you and I am trying to hang out here as long as possible. It’s really nice and cozy and I’m not ready to leave yet. You are doing all the right things. I love when Mommy rubs and makes me jump. I can’t wait to hear Daddy’s voice every day. Keep doing everything you’re doing! It was postmarked in Houston, which leads me nowhere as far as figuring out who could have “helped” our baby send us this note. So to whoever her helper was, thank you!! I cried, of course, but because it made me so happy. It was so thoughtful and unexpected. It’s on our fridge now so I can see it anytime I need to. We truly are blessed to have such a good support system and people that care so much about us and our baby girl! Weight Gain: about 17 on my home scale. 10 at the doctors office, but they didn’t start weighing me until my first appointment. Maternity Clothes: yup, definitely. My t-shirts are even getting a little snug. Belly Button In or Out: Still in for now. Getting more shallow by the day. Sleep: holy back pain! I have a really hard time getting comfortable. 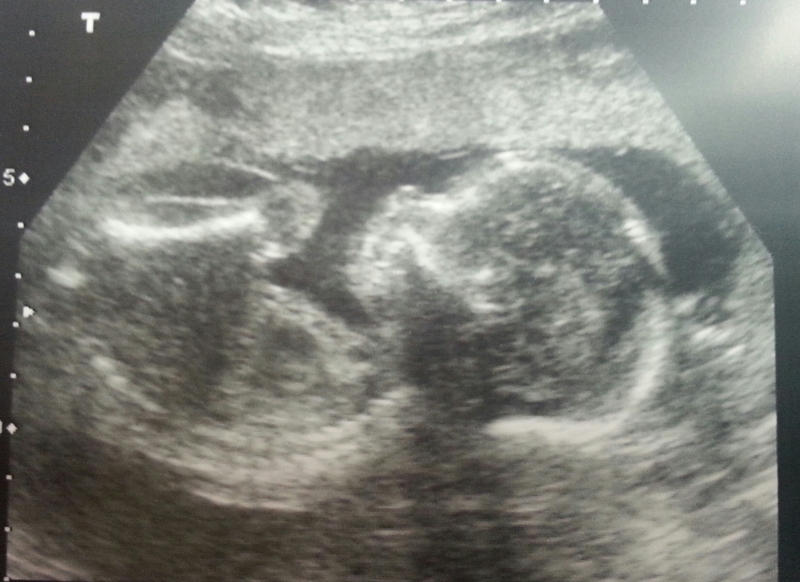 Best Moment This Week: Seeing her at my early anatomy scan. I wasn’t supposed to have my scan until next week, but due to some minor complications, they sent me for an ultrasound and they did all of the measurements then. She’s definitely a little girl, and is breech for now. She still has plenty of time to turn though. Miss Anything: Not worrying about anything. (More about my minor complications below. I’ll explain it all.) I’m trying to relax and not stress, but I catch myself worrying a little. Movement: Still pretty wiggly, but no hard kicks yet. I learned at my anatomy scan that she is breech, head up near the middle of my stomach and to the right a little, and her feet and booty are down low and to the left. So she’s definitely dancing on my bladder, and that explains why I feel so much movement down low to the left. She is actually facing my back right now, so that my be why I’m still only feeling her lightly and not any hard kicks or punches yet. I’m pretty sure I felt this weird rolling sensation a week or so ago, and that may have been her turning towards my back because before that I’d felt her a few times from the outside, but nothing since then. Cravings: Mexican food is definitely top of the list right now. And sushi. I had every intention of getting sushi yesterday after my visit to the doctor, but with the surprise ultrasound it was kind of late by the time I headed home and a little too close to dinner. Noteworthy Moments: So here’s what’s going on with me and Miss Whitlee. The short version is that I’m being monitored for Pre Term Labor due to early contractions, but we’re okay right now. The long story is this: I started having some cramping and tightening early last week that I basically shrugged off as Braxton Hicks. I’d read they could come this early, but the only thing sort of worrying me was that they hurt. So I kept an eye on them, but they never got any stronger or any longer or any closer together. They were about 20 minutes apart, lasting about 30 seconds and I’d have 3 or 4 and then they’d stop. Then an hour and a half later I’d have a couple more, then they’d stop. So very sporadic. Wednesday of last week, we had an extreme accident at work where two men almost died and I witnessed the whole thing and was actually the one that ended up calling 911 for our safety guys. We had to have one guy life flighted out, but we got word this week that he’s going to make it. Well after that chaos, I had 4 contractions inside 30 minutes, so I figured I better go ahead and call the doctor’s office to see what they thought. If they confirmed it was Braxton Hicks, I would have been totally okay with that. But when I told her they hurt too, she had me come in to get checked. Then my doctor got called out for a delivery, so they weren’t able to check me. The nurse found her heartbeat, which was normal, and put me on pelvic rest until Monday when I could come back and get checked. So I went back to the doctor yesterday and they were able to check my cervix, which was long, closed, and hard – all good things. But my doctor is convinced I’m having real contractions and not BH, so she sent me down for an ultrasound to get a better look at my cervix just to be sure. She wanted me to continue pelvic rest and also suggested I stop working and then asked if that was possible – which it’s not. Nolan and I are used to two incomes, plus we’re in the middle of a large project at work that actually needs me to be there. So she suggested I make some changes as far as being able to stay in my office and off my feet more than I currently am, which my boss was more than willing to accommodate. Anything to keep me there as long as possible! I think at this point, they’d be willing to haul a hospital bed in and have me work from that! 🙂 Anyway, so I went down for the ultrasound and although the ultrasound tech wouldn’t say much, she did say that my cervix looked good and that if she saw anything of concern in my ultrasound, that she wouldn’t release me and would call my doctor in, and when it was over she smiled and said, “Okay, you can get dressed and you’re good to go!” So I take that as good sign. I did get to see her arms and legs, spine and ribs and everything looked good to me. She is breech, but has plenty of time to turn (hopefully). The goal now is to take it easy, rest as much as I can and get these contractions to stop. I go back to the doctor next week and I’m sure they’ll check my cervix again. If the contractions continue, they’ll probably have me start coming once a week to get checked and once I make it to 24 weeks, I’ll start receiving steroids to mature her lungs in case she comes extremely early. She’s not viable at this point, so I need her to stay put in there for quite a while longer. Obviously my ultimate goal is full term, but getting her to where she could survive outside the womb is essential right now. She is still pretty active which is a great sign and I’m not having any other symptoms of concern (bleeding, swelling, etc.). So everyone cross your fingers or say a little prayer that our sweet girl is comfy in there and doesn’t come too early. I want to be fat and miserable (and happy!) at 40 weeks (or at least 37) and then she can come whenever she’s ready! Yay for fixing my hair and wearing makeup! HA! Gender Predictions: It’s a sweet little girl! Weight Gain: I have no idea.. I don’t know if I’m supposed to go by my scale or the doctor’s office. But around 15ish. Belly Button In or Out: Still hanging in there. Sleep: a little better this week. Still getting up to pee 9 million times a night. Seriously anywhere from 4-7! But I was getting up once or twice before I was pregnant, too. I think I have a small bladder! Best Moment This Week: Registering for all of Whitlee’s stuff! It was so stressful fun picking out everything for her. On the real though, deciding between SO many car seat/stroller options is exhausting. I finally decided on one that I think will be good throughout any future children. And oh em gee at baby stuff! It all makes me so excited! Miss Anything: nothing really! I’m enjoying pregnancy a lot more now that I’m not sick all the time. Movement: Miss wiggle worm is as active as ever. This is my favorite part so far, feeling her move all the time. I actually felt her roll from one side to the other a few days ago. So crazy! Nolan’s mom said he was crazy active in the womb also, so if she’s anything like her daddy, we’re going to have our hands full. He’s on the go all the time! Symptoms: Yay for less nausea! 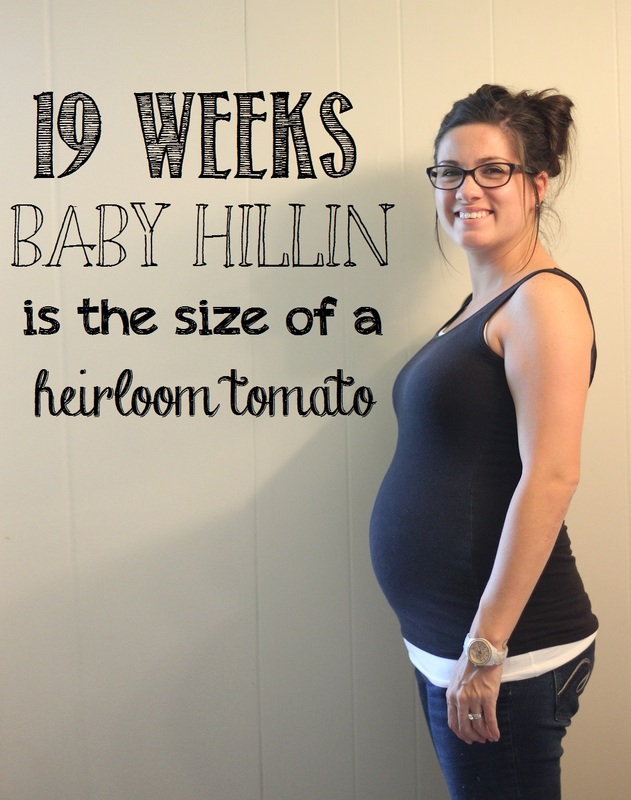 I think I’ve been having some Braxton Hicks this week though. I’m not 100% sure but from what I can tell, that’s what they are. Just hope they’re for practice and not for real. I get this crampy feeling, sort of like a moderate period cramp. Not really painful, but definitely not painless, and this last time I rested my hand real low like where period cramps would hurt and my uterus was rock hard! I left my hand there and it lasted around 30 seconds-ish, and as the pain gradually went away, I actually felt my uterus relax. Anyone agree that it’s probably Braxton Hicks? Noteworthy Moments: Whitlee’s room is in progress! I cleaned out the laundry room and hung new shelving in there so I can move all of my clothes in there and she can have a real closet. And registered for all her stuff, so I’m feeling quite accomplished! 2 more weeks til we get to see her again at the anatomy scan and we’ll be halfway to meeting her!